I am having a huge reality check this week, and I think I am also in denial. Can October be only a couple of days away? Really?! It is fun to feel the crispness in the air and the onset of fall, but I have also feel a little flurry of anticipation and anxiousness. Why you ask? Because I am running my 10th marathon this Saturday, and I have been struggling with injuries the past month which has affected my training and makes me nervous about the race. I feel blessed that I can still run and I am super excited to run with my sisters though! Enough about me... since I am getting ready to leave town and am super busy, I have another project I shared at My Repurposed Life this summer. 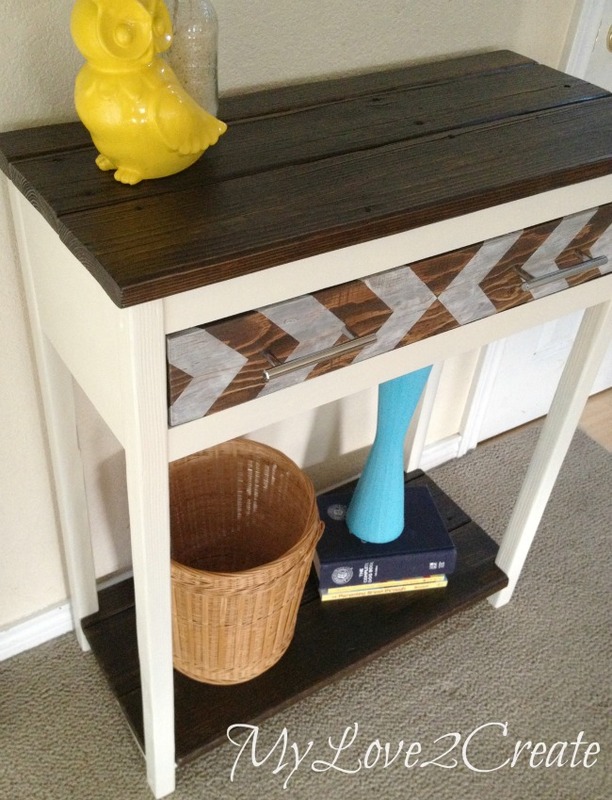 An entry table made from reclaimed lumber. ...with a pile of old deck wood. 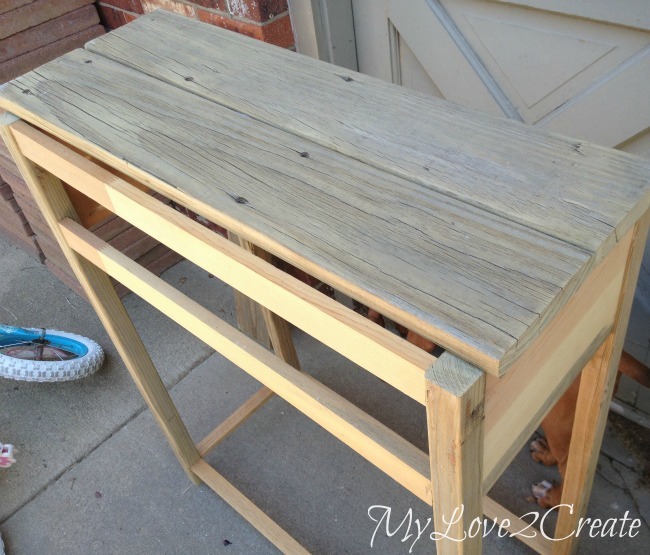 I love repurposing old wood, and I knew from my old deck wood laundry crate that this type of wood is perfect to use. Since I didn't use a plan I will show you the basic process I used to build. 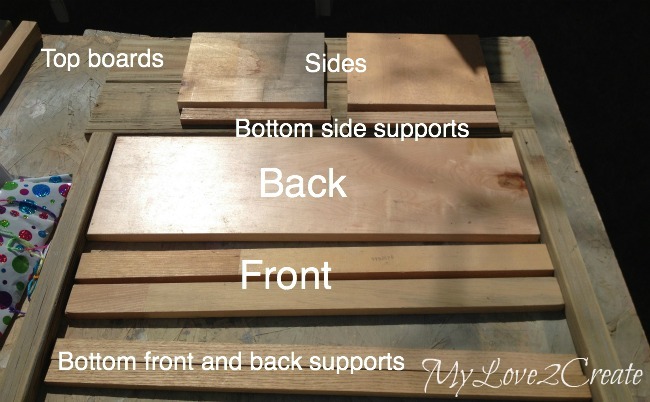 I started by cutting my top deck wood boards to the length I wanted. I also cut the deck railings, which I used for the legs, to the height I wanted. Then I placed the legs by the top boards with about 1/2 inch inset on each side, and began measuring and cutting the rest of the boards I needed. 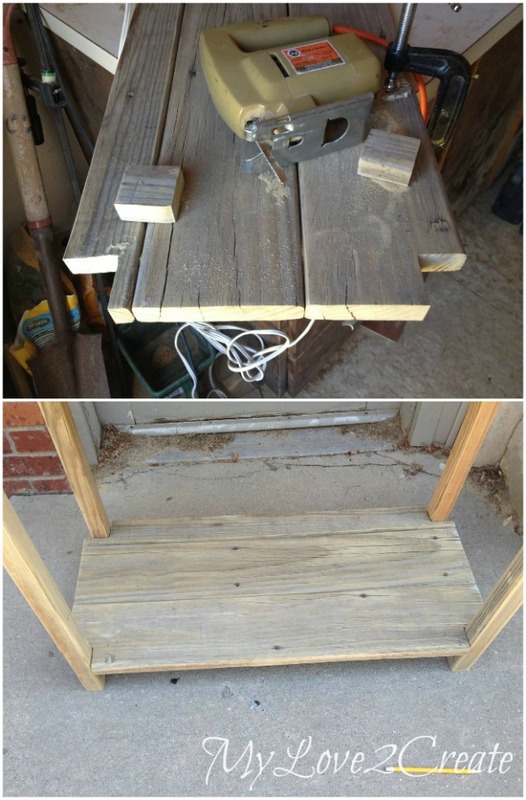 All of the wood I used in this project was old deck wood (the top, bottom shelf, and the legs) the rest was scrap wood I had collected free from craig's list. Above you can see I cut the back and front boards all the same length. I also cut the sides about 1/2 inch shorter than two top deck boards put together. Now with all the wood cut and sanded it is time to build! 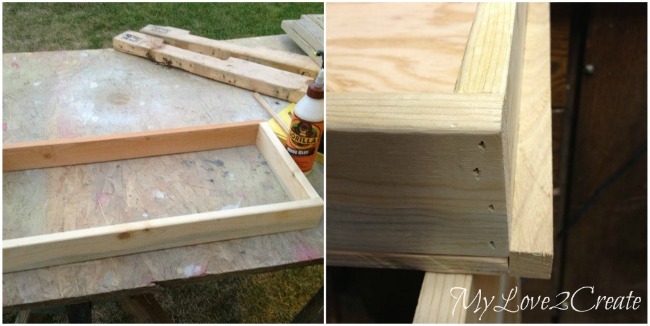 I drilled pocket holes with my Kreg Jig for a super easy and strong build. I have an older model and I honestly couldn't live with out it, but if you are interested in purchasing one I highly recommend the Kreg Jig K5. It is a new model and has some great features that I have been drooling over! 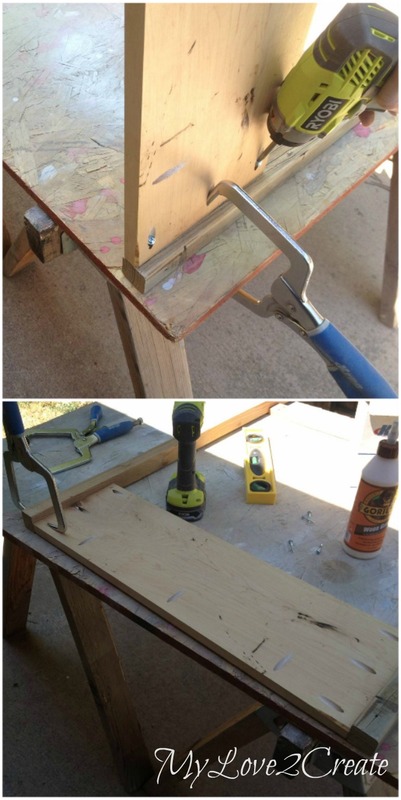 I used my right angle clamps to help attach the back piece to the legs, these clamps are a dream. You can see I also drilled pocket holes on the board for attaching the top later on. For the front I attached the two scrap boards to the legs, the opening is for the the drawer. Pocket holes make a strong hold, but I always love the added security of using Gorilla wood glue, my fave. 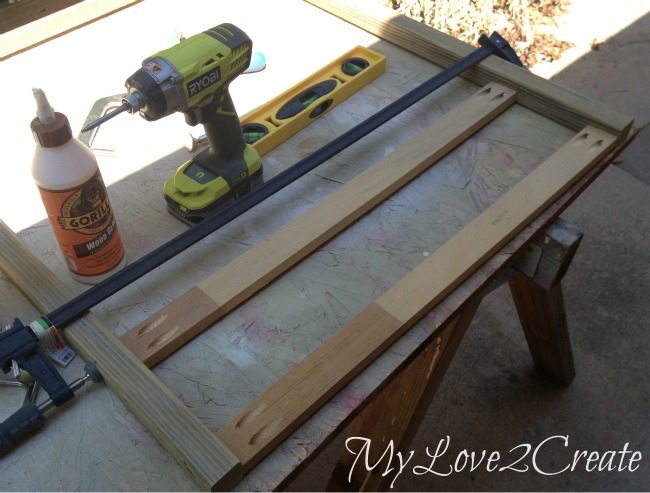 I am also still in love with my Ryobi tools too, this Ryobi Impact Driver has been soooo awesome. I love that I don't have a cord and it is super light, good for screwing in lots of pocket hole screws. 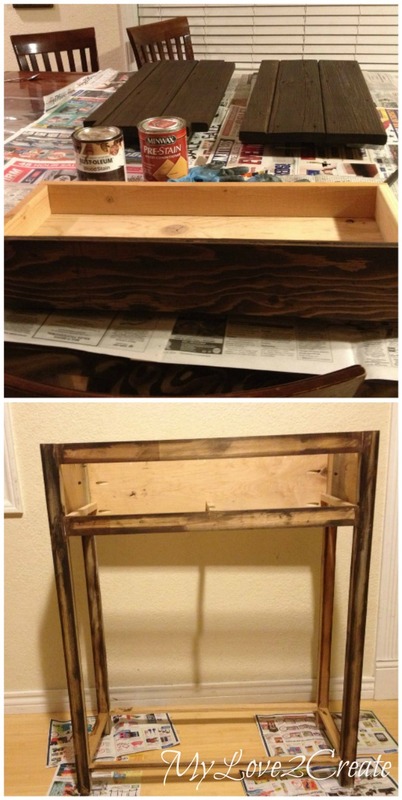 Next I added the bottom shelf supports, since the board was so thin I just did one pocket hole on each side. And that left me with this. The front and back of the table. Next up? The sides. I put the front with sides on top of the back, clamped it with right angle clamps, and screwed it together with 11/4 pocket hole screws. Easy! I say easy because clamping makes all the difference when drilling pocket holes...trust me, always clamp when drilling pocket hole screws! It is starting to look like a table! I used pocket holes on the back of the deck boards and screwed them together (can't for the life of me find the pictures, I know I took them...) Anyway, I was so excited and plopped the top on the table to see how it fit aaaaand.....it didn't. What? Took me a few seconds to realize why. When I measured the side boards to the top I forgot to include the legs in the measurement...hello! Since another deck board would make the top too big, I decided to just cut one in half. If I was lucky I would have a table saw, but I am not lucky, so I used the next best thing. 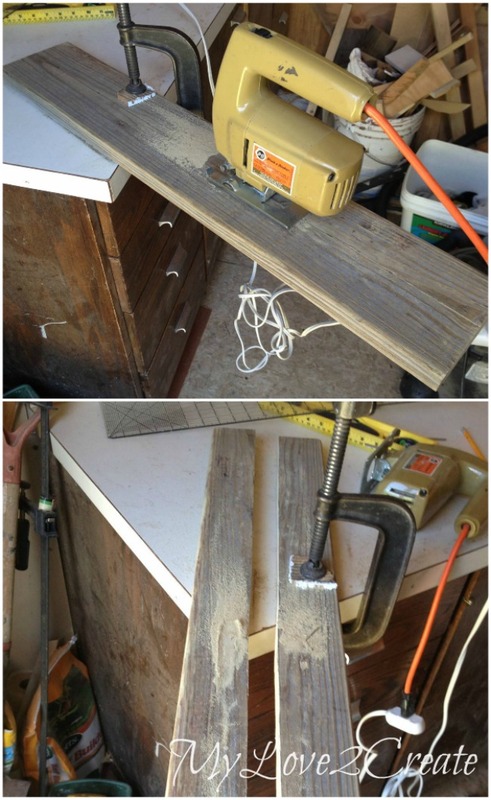 A jigsaw, my $5 Restore jig saw. It did the job and I can totally embrace the imperfections. I could have used a circular saw, but I think it is easier to match up the line with a jig saw since I had to cut half then flip it and cut the other. With my new short boards cut, sanded, and pocket holes drilled I attached them to the top and bottom shelf, making them both two and a half deck boards deep. Here you can see the top fits much better, and I am also marking where to cut my notches for the bottom shelf. It was easy to just set the table on the shelf and mark out the notches, just ask Sunny, she was a very good helper. With my jigsaw I cut out the notches on the lines I marked and it fit! I did mark and trim the sides and back to be flush with the legs, since they were a little longer. I used my circular saw to cut off the excess. This little table is now ready for a drawer. 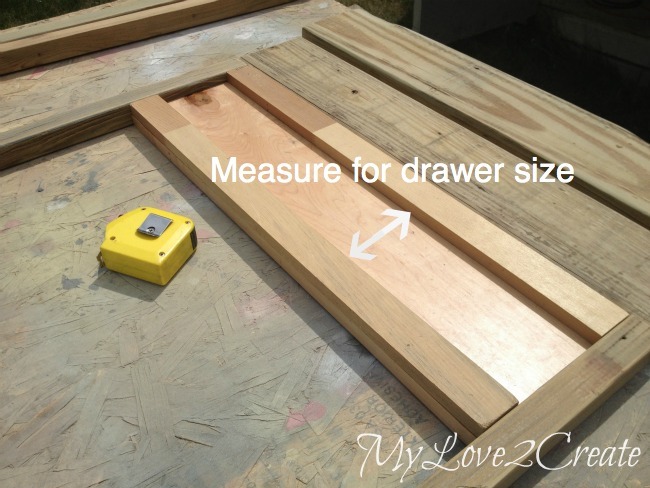 I actually measured for the drawer before I started building to make sure I had scrap wood the right size. The space above shows where to take the measurement. 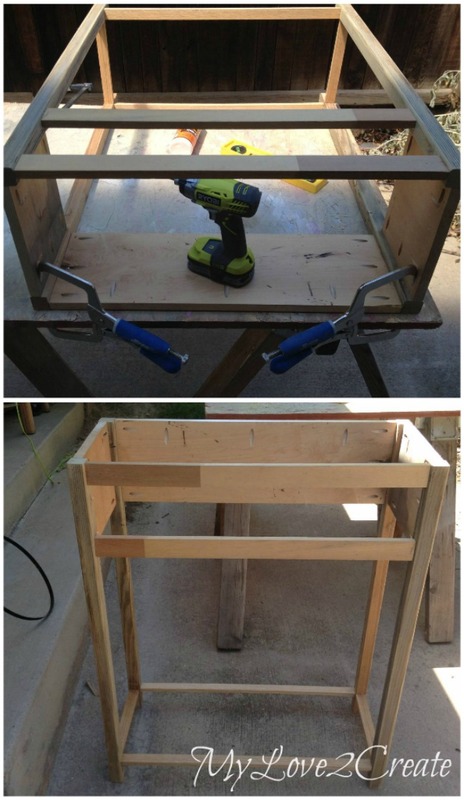 I used scrap 1x3's, to build my drawer. 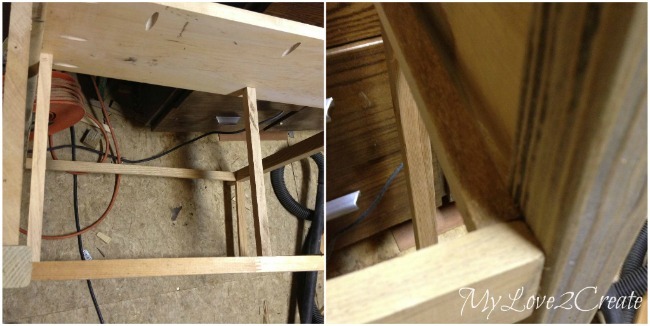 On the left is the drawer frame, I used scrap plywood to make a bottom (see top right). I am also showing my drawer glide attached to the side of the drawer on the right. I added one to each side of the drawer. The drawer guides slide over these support boards I added above on each side. And the middle one is extra support for the drawer bottom. I slid in the drawer, measured the opening for the drawer face minus 1/8 of an inch on all sides and cut scrap plywood. Then I glued and nailed it on. 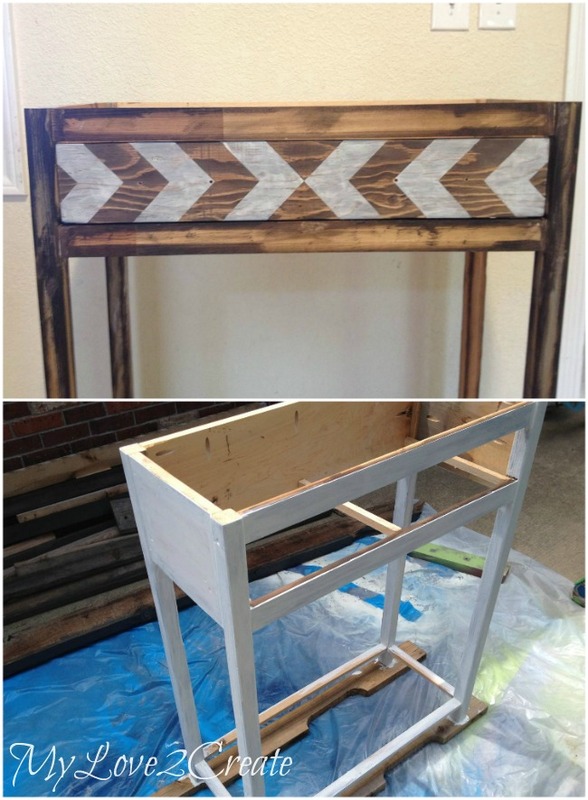 For a more details on how I did this you can check out my night stand makeover. With everything built it was time for the finish. 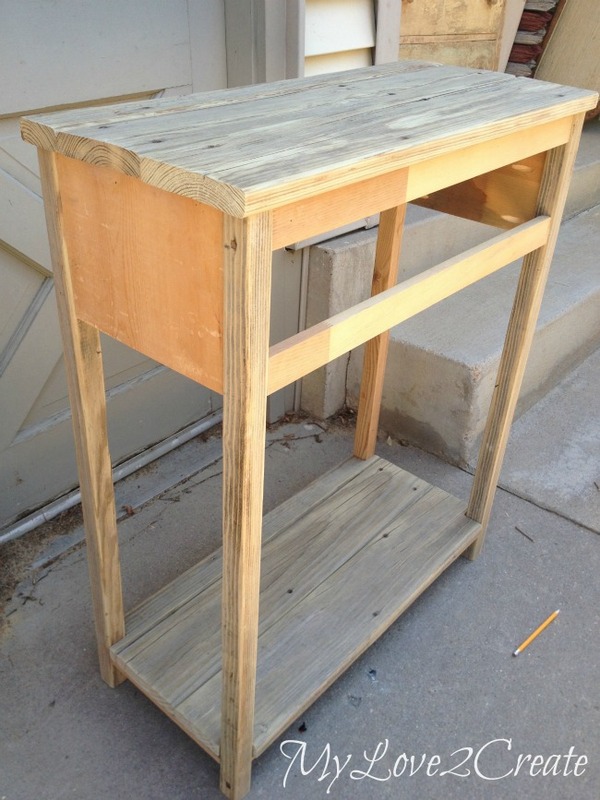 I used Rust-oleum's Kona (because that is what I had) and stained the top, bottom shelf, and drawer front. I had left over stain on my old sock rag and decided to rub it off on the edges of the table, just incase I decided to distress it. This table is pretty basic, so I wanted to add a little pizazz. I went with some arrows cut with contact paper on my cricut. 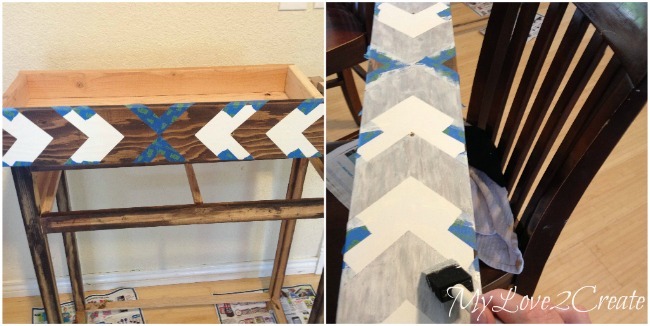 I also used painter's tape to complete the shape to the end of the drawer front and then did a quick coat of white and removed the tape while it was still wet. Once dry I distressed it by sanding it lightly. 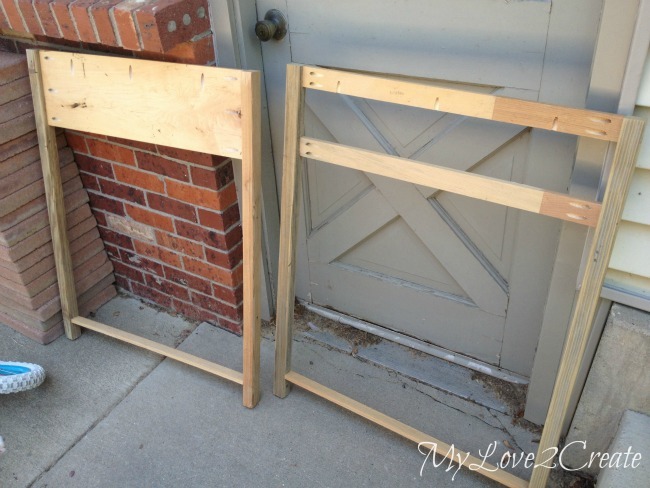 I found some great pulls at Home Depot and attached them, and I was finished! I am loving the drawer front. I did do three coats of poly sanding with fine grit between coats 1 and 2. 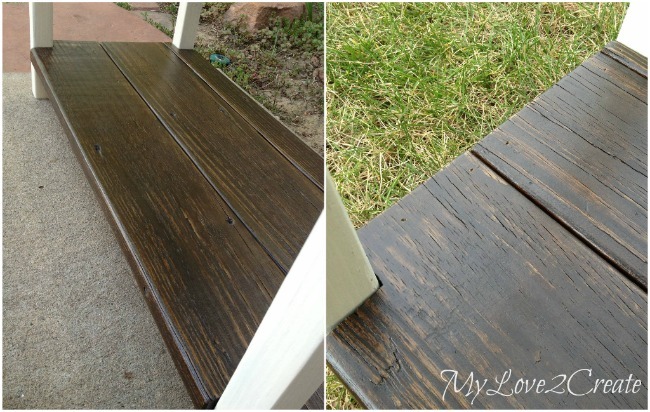 For a rustic yet smooth finish to the old deck wood. 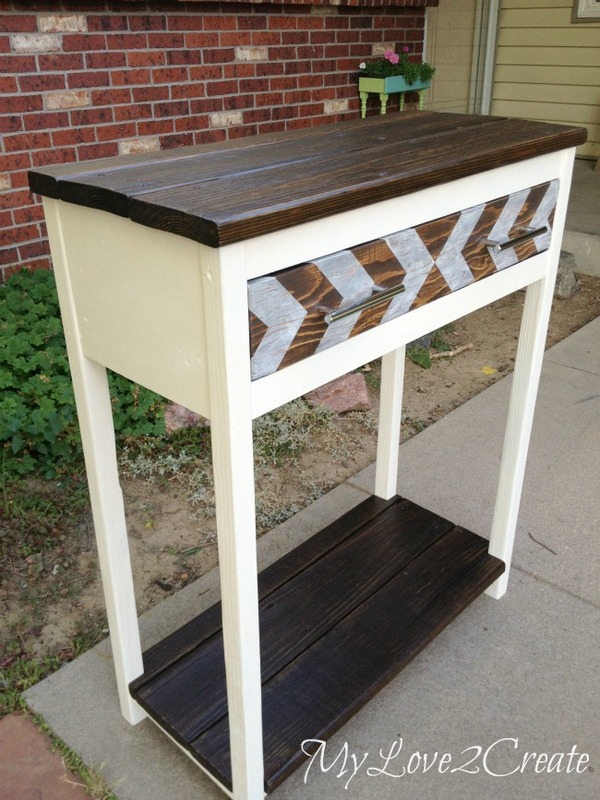 I love that it is taller than normal and makes a fun statement with the design on the drawer. Are you starting to see why I collect other people's trashed wood? 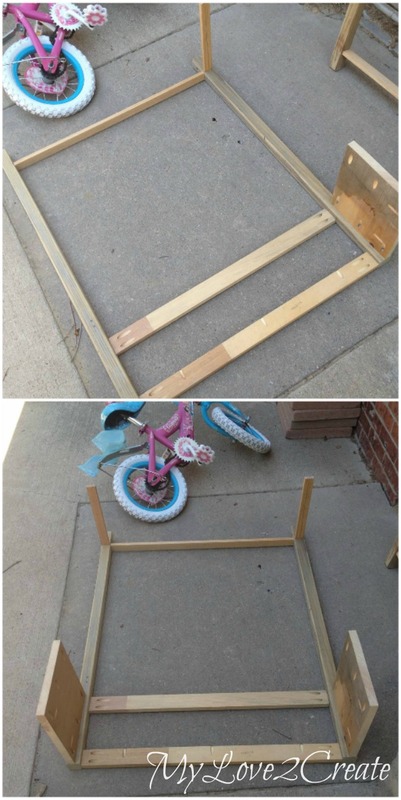 It has SO much potential with a little imagination and TLC. 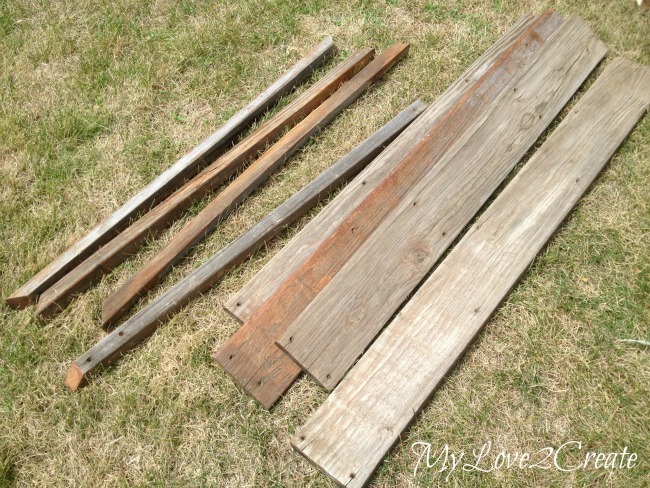 My reclaimed wood table was also made from trashed wood and it is one of my faves. 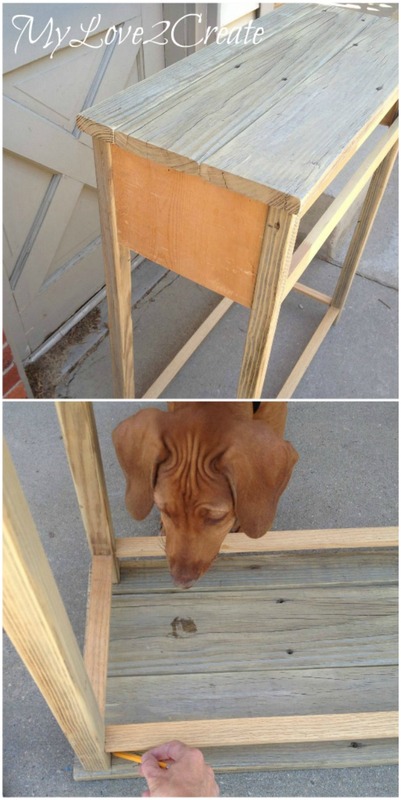 Do you think you would attempt building a table like this? It might be worth a try! Okay, a few things - I can not help but think of you when I see FREE furniture on the side of the road. lol Sorry, if that sounds creepy. ;) Seriously, I slow down my car and debate if I should hop out and get some free loot. I already have enough stuff, but maybe one day I will find that one thing I am looking for, even thought I do not know what it is. Yeah, that makes sense. 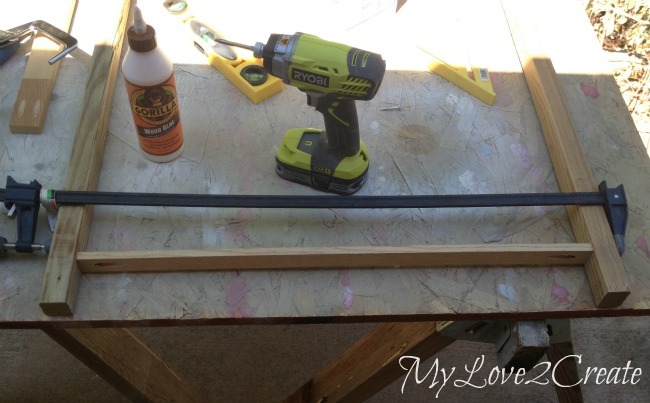 I LOVE your retro jig saw! How cool! What brand and year is it? Also, how do you like Rustoleum stain? Wowza! What a fabulous creation. Love the built-in drawer and the pattern you chose. Thanks for sharing your awesome creation at Vintage Inspiration Party. Wow that's an amazing table. I haven't made anything this elaborate yet, but I'm working my way there. Thanks for sharing on Merry Monday. Pinned. You know how much I love this table, right? It's like Mary Poppins "practically perfect in every way"
good luck with the run, be safe!!! Great tutorial and a marvelous result, beautiful table. Wow girl you've got some mad skills! 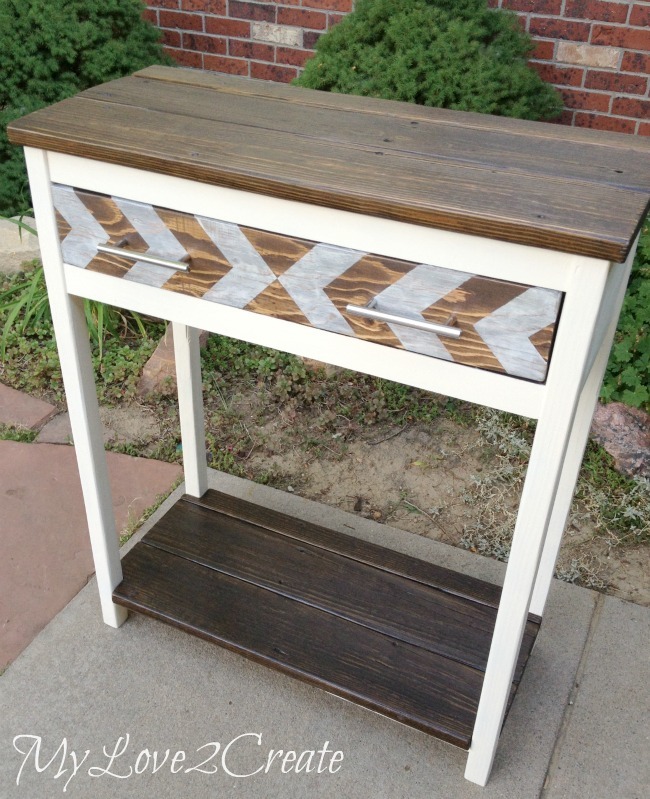 Impressive work and you made it from scratch, love the chevron detail as well. Great Tutorial too,..... Yup following! That is gorgeous! And you make it look so easy. I am pretty convinced I need a jig saw! 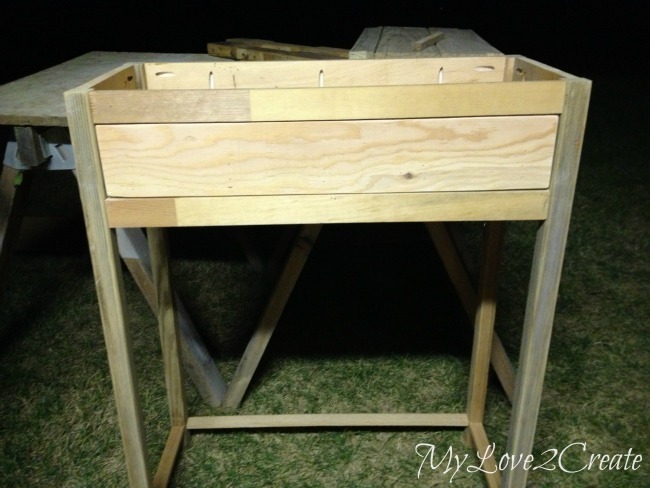 I will be featuring your project on tonight's Merry Monday party at 8 CST! Make sure to check it out and thanks for sharing! This table is absolutely stunning! Nice piece! I love the two tone you went with on it. 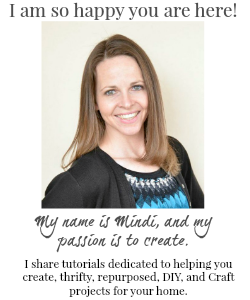 Wow Mindi, I'm impressed this was built from scratch. 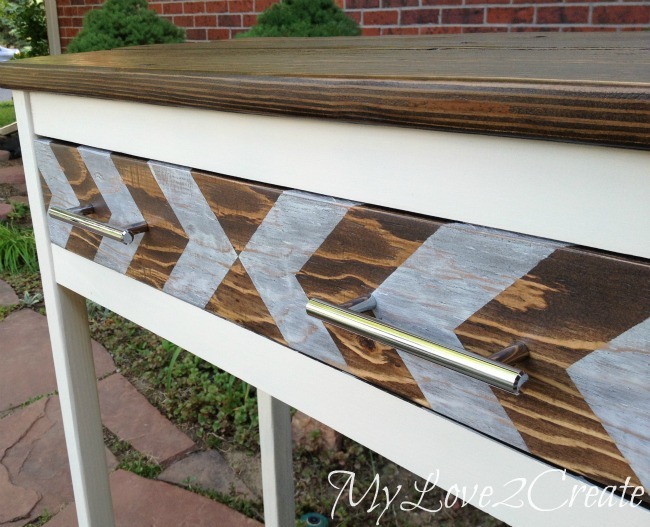 Love the stain color and the chevron stripes on the drawer too. Love it! Oh, goodness, Girl, you are one talented lady! I wouldn't have a clue how to do all that sawing and building...but you did such a beautiful job! It's very beautiful. I'm so impressed! wow! 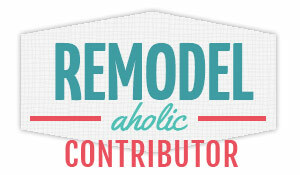 thanks for linking up to DIY Inspired! Lovely table! Pinning right now. 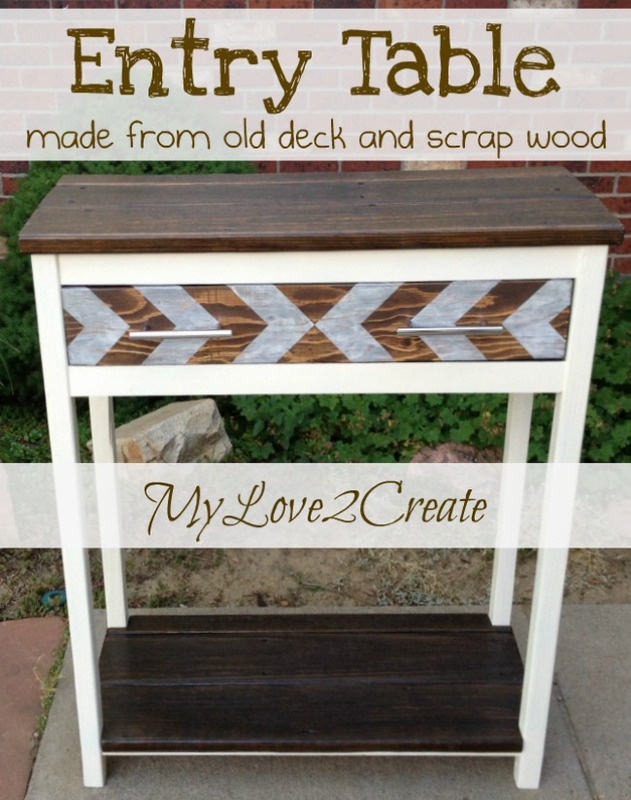 :) Thanks for linking up at the Creative Collection Link Party! You and your Rockstar project made it to our features last week! I absolutely adore the arrows!! It turned out so beautiful!!! I love the front detail.